This blog is to share how to run highly available ActiveMQ cluster in Master/Slave configuration. 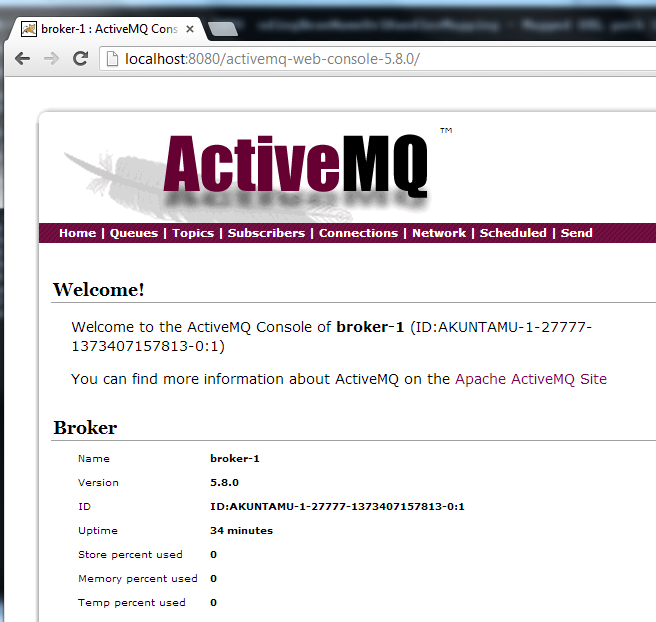 ActiveMQ broker(s) tends to be a core piece of messaging infrastructure in an enterprise. It is vital for this messaging infrastructure to be highly available and scalable. Please read this link in order to learn more about creating network of brokers to support various use cases. 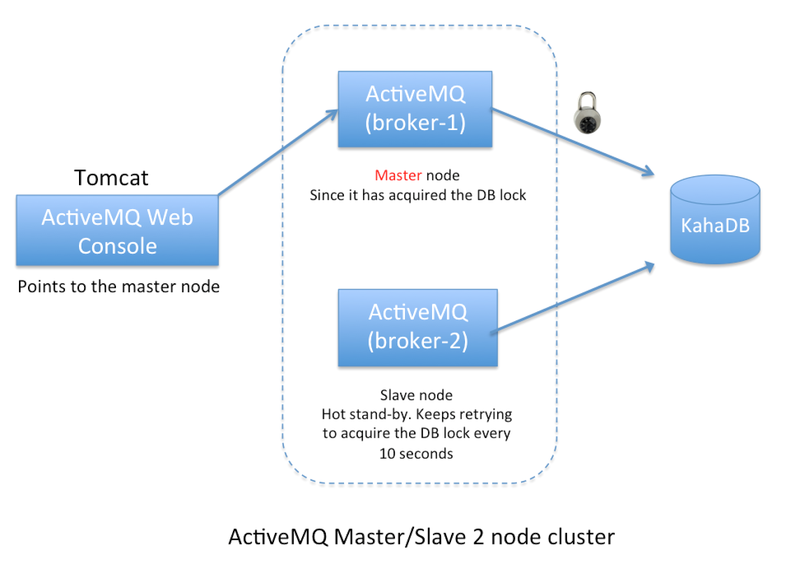 One of the popular use case for ActiveMQ is the Master/Slave configuration with shared database. When this configuration is used, the message consumers and producers can operate without interruptions as they use ActiveMQ's connection factory with failover protocol. The failover protocol insulates the consumers and producers from having to deal with any potential downtime or application level reconnection logic when slave ActiveMQ node takes over to become the master which happens if the current master node goes down for any reason. I must caution that this configuration must not be used to mask any issues which take out the master node. We should iron out any causes that result in an unplanned master node outage. Run 2 ActiveMQ nodes in a Master/Slave configuration with a shared KahaDB file based database. 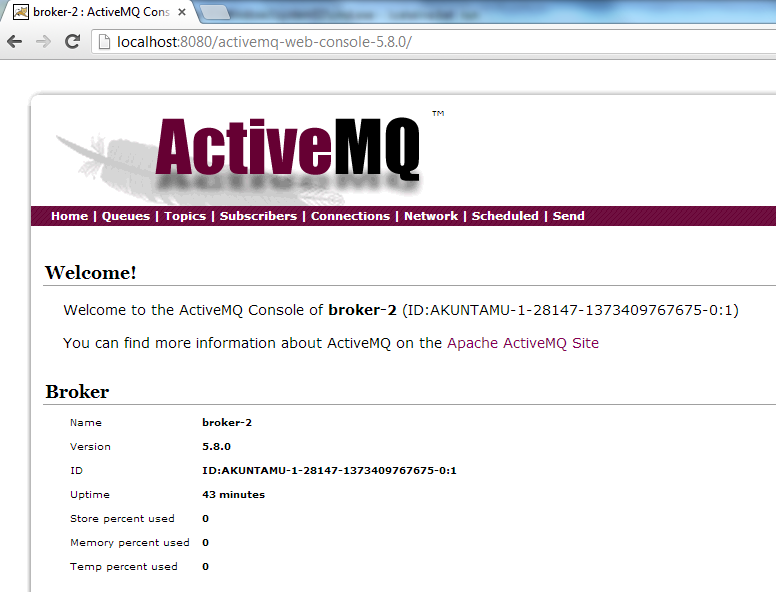 Configure ActiveMQ web console hosted in a Tomcat instance to point to whichever node is Master node in the cluster. Message publisher and consumer behavior oblivious to the failover. We will create a 2 node ActiveMQ cluster on the same Windows 7 machine. We will need to configure the ports (TCP & JMX) such that there is no conflict. ActiveMQ provides a script called "activemq-admin.bat" which helps in running multiple instances of ActiveMQ using the same binaries, very much like Tomcat. Let's go ahead and create broker-1 and broker-2 instances. These properties need to be fixed as we'd like ACTIVEMQ_BASE and ACTIVEMQ_CONF to be different for both broker-1 and broker-2. You may observe that both broker-1 and broker-2 nodes share the same ACTIVEMQ_DATA folder. Since we are using the in-built KahaDB for persistence, both broker-1 and broker-2 will share this. We need to differentiate the tcp ports for broker-1 and broker-2 and also enable JMX and configure JMX ports for remote monitoring. Let's edit the activemq.xml for broker-1 to enable JMX monitoring, notice useJMX="true" attribute below. Repeat the same for broker-2. set TCP port to 61626 and JMX port to 2099. INFO | Recovery replayed 1 operations from the journal in 0.028 seconds. You will observe that broker-2 is unable to acquire the lock since broker-1 already grabbed it. broker-2 will keep retrying to acquire the lock every 10 seconds. n: File 'C:\apache-activemq-5.8.0\data\kahadb\lock' could not be locked. Now let's configure the ActiveMQ web console. By default, ActiveMQ distribution contains admin web console but in the Master/Slave configuration, it is unknown which node is the master. So it is doesn't make sense to use the embedded web console. 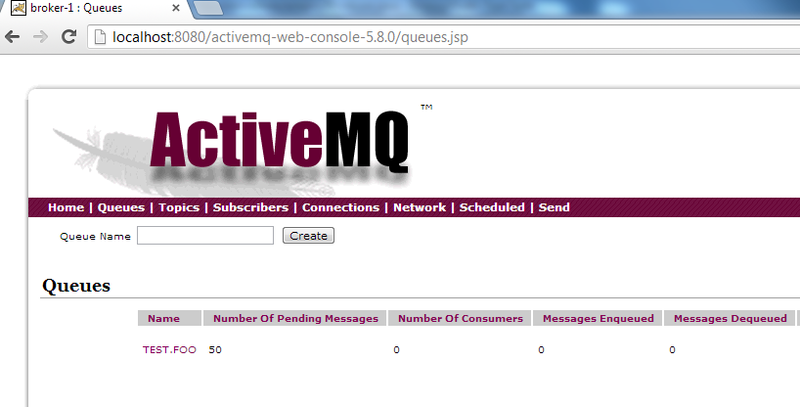 Hence it is best to have ActiveMQ web console outside of the ActiveMQ nodes. You can disable the embedded ActiveMQ Web Console in each node by commenting the following line in activemq.xml in conf directory of each ActiveMQ node. For our example, we will deploy ActiveMQ Web Console web application in Tomcat container and then configure ActiveMQ web console application to intelligently point to the master node in ActiveMQ cluster. 2013-07-09 17:28:13,960 [ost-startStop-1] INFO  WebConsoleStarter              - ActiveMQ WebConsole initialized. 2013-07-09 17:28:14,101 [ost-startStop-1] INFO  ndingBeanNameUrlHandlerMapping - Mapped URL path [/deleteMessage.action] onto handler '/deleteMessage. Use admin/admin for username/password if prompted. These are default security settings. Refer jetty.xml and jetty-realm.properties in conf directory. As shown above, "broker-1" is the current master broker. Now, if you were to shutdown broker-1. Hit Control+C on Terminal window running broker-1, you'd notice that broker-2 acquires the lock and becomes the master. INFO | Recovery replayed 2 operations from the journal in 0.022 seconds. As you may observe, now the master node is broker-2. Now that we have seen seamless switch over between the nodes during a failover scenario using an external web console, let's see the same from the perspective of a message producer and consumer. I will publish 50 persistent messages to a queue using a simple message publisher and have an asynchronous consumer receive those 50 messages. I will introduce a bit of a delay in sending the messages so we can take the master down a few times and create a few failover scenarios. The objective is to see how the failover protocol makes the node failover completely transparent and thus shields the application from having to deal with any reconnection logic. Here is a simple producer using ActiveMQConnectionFactory with failover protocol. Notice the highlighted failover protocol URL in the code snippet below. Here are the logs from execution while I shutdown broker-1 and broker-2 alternatively a few times. Here is the web console showing 50 messages enqueued. Don't bother the #Messages Enqueued = 0 in the above screenshot. This count represents the number of messages enqueued since this node started. Since I had restarted the node after the 50 messages were already enqueued, the count shows as 0. Now lets try to consume these messages using an asynchronous consumer using ActiveMQ connection factory with failover protocol. Here is simple asynchronous consumer with ActiveMQConnectionFactory using failover protocol. Here are the logs from the execution. I switched the master nodes a few times as evident in the logs. You may find the # Messages Dequeued = 11 very interesting. This is the number of messages dequeued from the current ActiveMQ master node since it started. In future blogs, I will post some other interesting ActiveMQ configurations. Stay tuned. Do you have url for webconsole war. Url you put in your blog is dead. There is a bug in 5.8.0 where the JMX connector is enabled for Slave node as well due to which webconsole becomes unable to distinguish master node from the slave nodes. I have created a fix for myself to remedy the issue. I will be sharing it over my next blog post soon. how did you fix it? and this bug seems closed. did you report that it is happening again? Yes. Infact I just fixed this yesterday for myself. I haven't had a chance to reopen this issue or to post my fix to AMQ group yet. In a nutshell, here is what I did. I added some more intelligence to RemoteJMXBrokerFacade class by extending it and overriding the findBrokers(...) method such that when it tries to obtain a JMX connection to a remote broker, it tests if the broker is a slave or master. If slave, it skips it and iterates to find the next broker in the list of URLs provided until it finds a master node. I will post the code snippet next few days. I have posted the fix here. Let me know if you have any questions about the same. Hope this works out for you. Does failover only work with messages sent in "persistent" mode? @johnlindwall Yes. Failover works only for persistent messages. Non-Persistent messages are in transient. If the broker crashes, those messages are lost. There is no way for the other broker to get hold of those. That makes sense. I am trying to demonstrate fail-over in ActiveMQ 5.9.0. Our application uses non-persistent messages but if required for fail-over )and if performance is acceptable) we could switch to persistent messages. My problem now is an inability to make fail-over work (persistent ot non-persistent). The slave does indeed take over for the master, but my publisher client code gets an exception: "javax.jms.IllegalStateException: The Session is closed"
I will follow your footsteps above and see if I can demonstrate fail-over using your instructions. I'll let you know how it goes! I successfully followed your steps. There were some minor differences in 5.9.0. I did not go to the trouble of deploying the console to the external tomcat. One last discovery to share: failover does indeed seem to work with non-persistent messages. The messages must be recorded in kahadb even though persistence was not requested in the delivery mode? Seems a bit odd, but it is very good for my use case! We want to use non-persistent messages but benefit from failover. I'll try to get this fact confirmed with the activemq folks. Thanks again for your awesome blog entry that really boosted my productivity today! CORRECTION: Fail-over does not preserve in-flight non-persistent messages! I had fooled myself in my testing setup. For non-persistent messages, fail-over will switch from a failed master to a newly-activated slave and message processing will continue but messages in-memory by the master at the time of the failure can be lost forever.